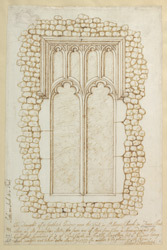 Drawing of a Gothic window (which was taken down in 1773) near the Font in St Mary's Church in Cannon Street in Dover. It was originally a small Norman Church with tower. It had several changes over the centuries including upper levels added in the mid 12th century and enlargement in the thirteenth century which brought it to its present size. The church lost much of its stained glass during the Second World War although one original 13th century window was reset in the South wall of the Chancel.